Eve's Alexandria: "All we've got left is the future." "All we've got left is the future." Memories, I've been told, are crucial. Memories are what you are. Forget your worries about what you will become - that will take place anyway - surround yourself instead with things which are important to you, even if they are painful. Submerge yourself in time. Swim in it. Drown. Well, I'm doing this now, sitting at this desk. I promised myself that my reading and posting about this year's Arthur C Clarke Award shortlist would be less rushed than last year's. I certainly wouldn't let myself get to just over a week before the announcement and ceremony with five posts still to write. Oh no. Definitely not. Ahem. The first installment of my Clarke shortlist posts, about Sheri S Tepper's The Margarets, takes the form of a review over at Strange Horizons. (Aside: in case anyone's interested, I recently updated the post indexing Alexandrian reviews that are hosted elsewhere online.) Now, at a pace that could hardly be mistaken for swift, I move at last onto the second - and my current favourite for the winner: Song of Time by Ian R. MacLeod (whose earlier novel The Summer Isles I read and adored back in 2007). Song of Time is, as the header quote should indicate, a novel about remembering and forgetting: how our experiences, our responses, and our memories of both those things make us the people we are. In keeping with this, the story is shaped around the narrated recollections of its central character, Roushana Maitland, a former concert violinist now living out her final weeks at her home in Cornwall. With Roushana, we look both backwards and forwards, simultaneously: her eventful life is our future, spanning a twenty-first century filled with great promise, creativity and technological advances, but also with environmental collapse and political upheavals. "The past's gone, darling. The hopes and theories mean nothing. All we've got left is the future." But what does it mean when the future is no longer something to be dreamed of, but something inescapably present? This is a sentiment expressed by several characters in the course of the novel, whether (more or less) positively - "'I mean, what I said about the future. I was wrong. The future isn’t something waiting ahead of us any longer. We’re living with it. It’s with us. It’s everything. It’s here'", as Roushana's brother Leo puts it - or wearily, as when Roushana recalls Leo's words, decades later: "The future's here, Sis. It's been and gone. And I'm still here. And so, now, are the dead." For Roushana and her family, and for the world around them, the future collapses into the present with stunning force, including but not limited to an eruption of the Yellowstone supervolcano in the US. Only slightly less convulsive are the political and social upheavals Roushana lives through in Birmingham and Paris. These are the large-scale events of a more traditional science fictional future, transforming humanity's way of life, in a few fell swoops, beyond recognition. But equally devastating, in MacLeod's novel, is the slow drip-feed of time marching on, of the future becoming the present, and then the past. Viewed from one angle, after all, what is the future but the inevitability of death, for you and everyone you love? Unsurprising, then, that the novel's central technological speculation is concerned with memory as a way of taking the past into the future - and thus, perhaps, of staving off death. Like Griffin Brooke in The Summer Isles, Roushana is a private, somewhat evasive narrator, a combination of English reserve (her mother is of Indian descent, her father Irish, but this is one cultural trait Roushana has fully absorbed from the land of her birth) and semi-calculated obfuscation; like Griffin Brooke, there are painful, unedifying truths in her past and her self that she would rather avoid. But Roushana has two reasons to tell her story, now. The first offers both a thematic touchstone - foregrounding the interplay of past memories, present realities, and hopes of the future - and a convenient device by which Roushana must order her recollections (somewhat) sequentially: she is making a sort of recording of herself, on a implanted memory-crystal, through which she, or something like her, a ghost-self built entirely of memory, will live on after her death. They're not everywhere yet. But they're getting there. The cities nowadays - London where Edward lives, and Maria's Barcelona - are filled with these spillages of strange movement which catch at the edges of your eyes. Even in solid, stolid old Fowey, it's often hard to tell exactly what people are seeing now that its main streets are enmeshed in the ever-spreading network of crystal. For most of my life, the idea of someone talking animatedly to something you can't see has been commonplace. My grandchildren chase ghosts across Morryn's lawns on the rare occasions they visit me, and that women over there is laughingly embracing a near-invisible friend as she stands outside an antique shop and debates some purchase. The second reason - and driver of the plot in Roushana's present, such as it is - is that a nameless, memory-less, identity-less stranger has washed up on the beach near her home. 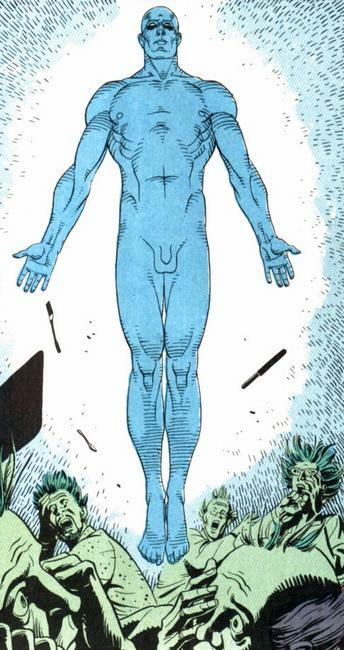 (That's him on the cover; I wasn't wild about the cover to begin with, but even less so since I started reading Watchmen, because now he just makes me think of Dr Manhattan.) The stranger is a metaphor, obviously, but also more. She has taken him in, is nursing him back to health in her memory palace. Filling the memory crystal is, of course, a trying process: its linearity is undermined by the inevitable randomness of which objects and images catch her eye in a given session - if never quite to the fractured extent that I imagine would really happen, if such technology existed - and it inevitably trends towards the old wounds, the emotional highs and lows rather than the mundane connecting tissue (another neat in-book rationale that ensures those parts of Roushana's life that we see are the dramatic, even melodramatic, ones). I was exhilarated. I was terrified. My skin crawled. I drove myself so hard and did without sleep and ignored my mother's occasional pleadings. This isn't the only thing in life, Roushana. You're over-stretched. How stupidly wrong could she be? Of course it was the only thing! I wanted to be stretched so far that I snapped into disparate pieces and then to examine my flayed body and find out what those pieces were, and what lay beyond. That might get rid of this curse of being merely good. [...] The swaying figures surrounded me. I was touched by gaunt fingers. I felt their hollowed breath. I shared the fatigue of centuries. On summer nights, as barricades went up and the helicopters flickered closer and cars were rolled and the flaming streets of Balsall Heath played orange across thunderous skies, I breathed the acrid smoke of funeral pyres. When the rains raged and the gutters giggled like gargoyles and fish-condoms swam in the streets, my teeth were gritted with the soils of the grave. On broken-glass mornings, exhausted but elated, the taste of dried blood was still on my bitten tongue as I trudged through the blasted world. My bleeding fingers stained the strings of my violin. It had to hurt. When it didn't, I knew I hadn't done enough. [W]hether he wandered the clinic corridors or prowled the Parisian streets in search of fresh donors, all he saw was a fallen world. The unreachable skies teemed with promises of different flesh, intricate metals and plastics - new skins, new clothes, new perfumes, which cost more than the supposed worth of many people's lives. So he knew that this world was fallen and ending long before he understood the scriptures, for the world of scriptures was already all around him. The Paris sections are the highlight of the book, tense, explosive and immersive. Roushana's memories continue, but - for us as for her - everything after this glittering time is slightly disappointing by comparison. Roushana and Claude live on together, in the house in Cornwall, but they are increasingly strangers to each other and themselves - as Roushana reflects after his death - struggling to separate themselves from their public faces, their performance. When, in the present, the recovering stranger begins to ask questions, Roushana's already-fragile control of the narrative of her self begins to slip. Past and present alike begin to unravel. In a final moment of melodrama, Roushana reveals the terrible secret that she has been skirting around throughout - but there is a sense in which it is inevitably (deliberately?) anti-climactic, after all the build-up of emotion and evasion. But it is, nevertheless, a release. I'm left thinking of how stories about ghosts often centre around spirits haunting places (so apt, here), trapped by traumatic, unfinished events, finding release only through the resolution of those events. In light of which, however unsatisfying the secret and its revelation are, the clear-eyed decision it triggers in Roushana seems utterly right: she has her resolution; the future can go on without her. Not quite up to the standards of The Summer Isles, then - but, as I said, my personal frontrunner. Four posts to go!